Where else in the world can you wake up on an average boring Tuesday morning, contemplating the start of another work day, only to find yourself just hours later enjoying a ridiculously delicious Michelin starred meal with the one you love while staring out on gorgeous Central Park. Only in New York my friends, only in New York. And that’s the way it began. My alarm went off Tuesday morning and I headed to the bathroom for my usually shower and go routine. However on my walk from the bedroom to the bathroom I noticed something. A feeling of dread. Now I have to say I'm kind of lucky. While I wish I never had to work for a living, I truly don’t hate my job, I even kind of like it. Which is why this feeling of dread kind of startled me. I don’t usually feel like this? However there it was and there was no denying it. I was dreading absolutely everything about going to work that day. The weather was freezing, my commute was to the farthest office and I was so sleepy I felt a little bit like Rip Van Winkle. So I did what I deemed the only appropriate thing to do in this situation- take a personal day. A quick call to my supervisor and I was back in the warm loving wrap of my comforter in bed. I awoke three hours later completely refreshed and ready to enjoy a whole day to myself. Of course a day off for me always means at least one thing- a fancy lunch. Being as obsessed with food as I am, it can be difficult to hear people talk about their favorite new dishes at places I would never be able to afford on my salary. Marea is one of those places. It seemed to be on almost everyone’s list for best new places of 2009. However looking at the menu I knew that between our regular expenses and saving for a wedding, the chances I would get to try it this year seemed pretty out of reach. But lunch was a different story. Checking online I noticed they offered a $34 prix fix business lunch that was right up my alley. I jumped on Opentable and was able to secure a reservation. Now usually these days off I do a solo lunch, but since I was going to be in Midtown I asked Mr. T if he could meet me. Luckily all his meetings were scheduled for the morning- his afternoon was free! Yay! We could enjoy lunch together. I did a couple of errands and then took a nice long walk from our apartment all the way up to Columbus Circle and the entrance to Marea. Mr. T met me there and we got seated in the bright gorgeous dining room overlooking Central Park. 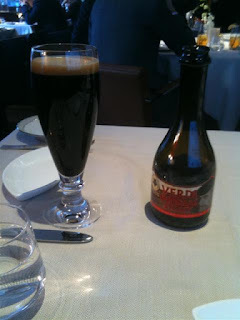 The first thing we noticed on the menu was the astonishing large amount of Italian beers on the drink list. Even when we were in Italy they never seemed to have more than Peroni or Moretti. Here there were beers we had never even heard of before. Mr. T decided to try out the Verdi Imperial Stout. This beer poured a deep thick black with big frothy head and a wonderful carmel chocolate smell. The taste had strong notes of chocolate as well with a smooth clean finish that made this extremely drinkable and tasty. I ordered a glass of Verdiccio and we started our meal with a nice selection of bread. Sourdough, whole grain and focaccia were the options and we both chose the last. The focaccia was wonderful with a crisp buttery top and big pieces of olive baked right inside. It was so good I considered having another piece but I know better than to fill up on bread because we had a lot more food coming. The first of which was the Ricci. I had heard this item mentioned the most from past reviews of Marea so I knew I wanted to try it. It actually is not listed on the lunch menu but the waiter checked with the kitchen and they were happy to put one together for us. 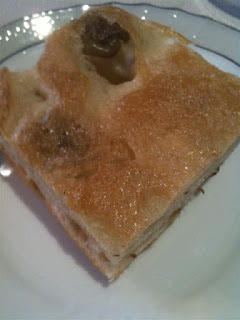 It’s basically Sea Urchin, lardo and sea salt on top of a little piece of bread. Wow- how something so small can have so much intense flavor is beyond me. The sea urchin was so incredibly fresh and velvety smooth it was unreal. I don’t know if it was the addition of the fat and salt or just the fish itself but there was no briny taste at all, just pure rich flavor. 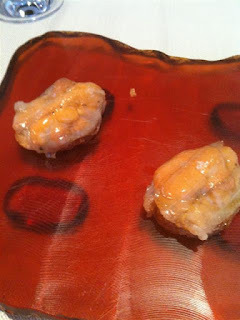 I have never been able to adequately describe the taste of sea urchin. Mr. T had a bite and said it tasted like the smell of plants in a greenhouse on a warm summer day. Did that make any sense to me at all? No. Is he an extremely weird individual sometimes? Yes. Anyway it was amazing needless to say and we were off to quite a great start to our meal. For our next courses I ordered the Tonno and Mr. T had the Vongole. 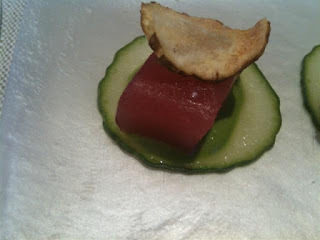 My bigeye tuna came with a little oyster crema, cucumber and a crispy chip on top. Again the quality of the fish really came through. 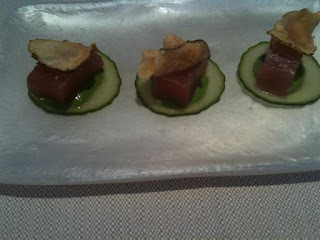 The tuna was so soft and luscious it may have been one of the freshest pieces of tuna I’ve had in a long time. I was really excited about Mr. T’s dish since he has been dying to try geoduck. The funny thing is that I ended up liking it better than him! 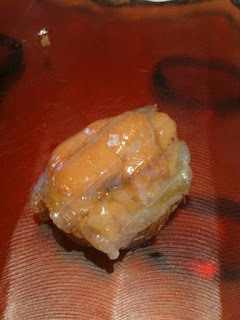 The slightly rubbery texture just turned him off from the dish but I found the flavor and texture quite enjoyable. The addition of the chilies and lemon to the top gave it a delicate balance of sweet and spice. For my main course I ordered the Red Snapper with marinated salsify, brussel sprouts, fresh pancetta and soba. I really didn’t think it was going to get any better than the appetizers but this dish just knocked my socks off. The snapper itself was cooked so perfectly and had such a wonderful sauce there was no need for the big chunk of pancetta at all in my book. 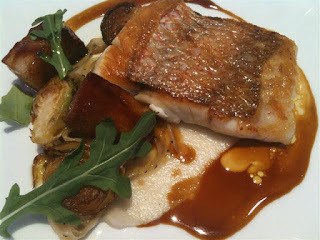 The brussel sprouts and salsify were the perfect crispy accompaniment to the fish and I ate every single last bite. Seriously, not even a speck of food was left on my plate. That snapper was quite possibly one of the best fish dishes I have ever had. Since we were in an Italian restaurant it would have been wrong if we didn’t get at least one pasta dish so Mr. T ordered the Fusilli. 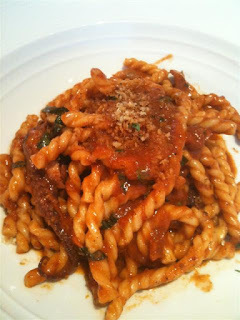 The Fusilli was a mixture of durum wheat pasta, red wine braised octopus, and bone marrow. Seriously something weird happened to me when I took a bite of this dish. I immediately pictured an old woman cooking away in her small Italian kitchen, making sure each and every ingredient has just the right amount of love added into it. Weird isn’t it? Well I guess Mr. T and I are both a little bit weird. It was hearty, rich and delicious pasta that’s for sure. We were both way to stuffed after our entrees for a full dessert but we did enjoy the petit fours they brought out with the check. 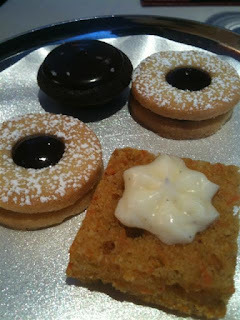 Two linzer cookies, a mini carrot cake and a chocolate caramel dome were the perfect sweet end to a wonderful meal. Overall I thought Marea was absolutely fabulous. 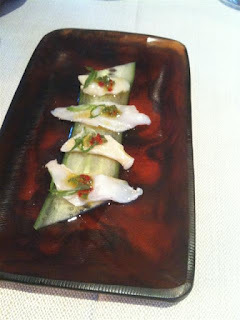 They are certainly using some of the freshest ingredients in town and really showcasing what fish is all about. The service was friendly and attentive, the atmosphere was comfortable and the food was fantastic. My only minor quibble would be the price. I had checked Marea’s website online at home before going and it stated the lunch prix fix at $34. However at the restaurant the prices had been raise. The prix fix lunch was now $ 38. Sure it’s only $4 but I just wish they had updated their menu online so I would have known before. Luckily they did have some reasonable glasses of wine on their menu which made up for the increase in price so I give them a kudos for that. Mr. T and I left Marea with a slightly lighter wallet but full happy bellies. I have to say it may have been the best Tuesday I have ever spent in the city.